Do you remember shows like Maskman, Fiveman, Mask Rider and other Japanese live action shows growing up? Were you a huge fan of those shows as a kid? Are you still a huge fan of those shows and other Tokusatsu shows? Finally, did you ever dream of meeting some of the actors/actresses in person? If you said ‘yes’ to any of those questions, my friend, I’ve got some good news for you. The wonderful people from Japanese Entertainment Fusion (JEFusion), one of the top Japanese entertainment blogs in the world, has partnered up with several groups to bring us HENSHINCON 2015! 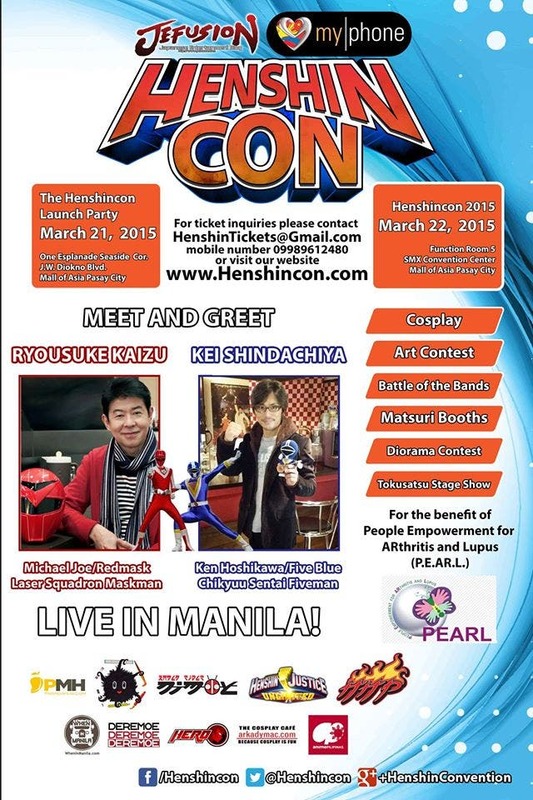 Henshincon 2015 is a 2-day event that will happen in the Pasay area and will feature loads of fun activities for the Filipino Tokusatsu fans. If you’re ready to go this weekend, good for you! We can’t wait to see you this weekend! But for those who are still unsure in going, we’re here to give you FIVE reasons why you should attend Henshincon. So much things to do like..a karaoke session with these girls, perhaps? Henshincon will have a lot of activities, no doubt. You will have the following events during the March 21st launch party: (a) a 1-hour panel discussion with the special guests Ryosuke Kaizu (Red Mask) and Kei Shindachiya (Five Blue), (b) a special auction, and (c) a surprise guest performer. The main event in March 22nd will have a handful of contests such as the Diorama contest, Original Henshin Hero Character design contest, a cosplay competition, a battle of the bands and many more. 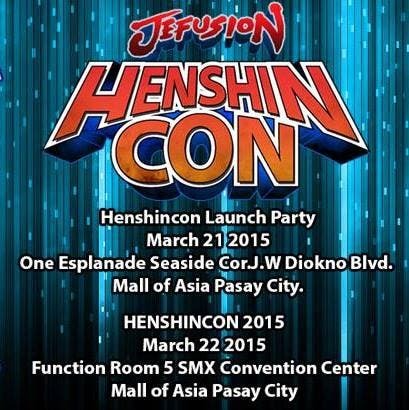 Basically, there are a lot of fun activities for everyone who will attend this Henshin-filled weekend. Henshincon will feature a lot of awesome cosplayers in the Philippines. So look out for the dedicated cosplayers around the event dressed up as their favorite Super Sentai, Metal Heroes, Kamen Rider and other Tokusatsu characters. Henshincon has a couple of confirmed celebrities in attendance as well such as former Sponge Cola drummer and current YouTube/cosplayer extraordinaire, Chris Cantanda! Henshincon will be a 2-day event where a lot of fellow fans of Super Sentai, Mask Rider, Power Rangers, etc. will convene. For sure there’s a chance you will meet your fellow fans and even make friends with them during Henshincon. Sounds awesome, right? 4. Meet Two Super Sentai Legends in Person! Attention to all the Maskman and Fiveman fans, two main actors from the two Super Sentai series will be part of this event. That’s right; Ryosuke Kaizu (Michael Joe/Red Mask of Laser Squadron Maskman) and Kei Shindachiya (Ken Hoshikawa/Five Blue of Chikyuu Sentai Fiveman) will be in attendance for all the die-hard fans of Maskman and/or Fiveman. The launch party guests (on March 21st) will have a chance to ask the two actors on their respective experiences on being part of the Super Sentai series and other topics. At the main Henshincon event, it will be YOUR opportunity to meet the two in the flesh and maybe even get a selfie! If there’s ANY reason why you should be attending Henshincon, it’s to relive your childhood. If you’re a 90’s (or even 80’s) kid, it’s going to be the ULTIMATE trip down memory lane. You’ll be seeing a lot of Super Sentai or other Toku-related items and references. You’ll be meeting people who also are into the fandom. Most of all, you’ll be seeing 2 of your childhood heroes in person. Now that, my friend, is why Henshincon will be your ultimate throwback weekend this March 21 to 22nd. Those are my five reasons why you SHOULD attend Henshincon 2015. 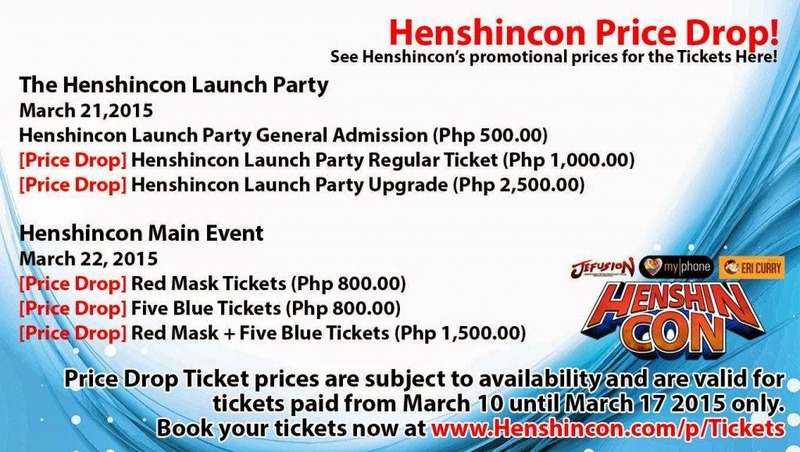 If you have more reasons why you or others should drop by the weekend event, just drop us a line at the comments section and share it with the rest :) Henshincon will be having its Launch Party on March 21st at One Esplanade Seaside Cor. J.W. 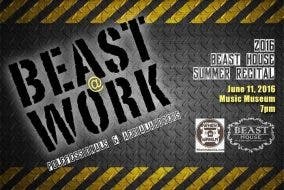 Diokno Blvd, Mall of Asia Pasay City from 5 PM to 10 PM (doors open at 4 PM). The March 22nd event will be held at SMX Function Room 5, Seashell Lane, Mall of Asia Complex, Pasay City, Philippines from 10 AM to 8 PM (Doors open at 10 AM). PROMO ALERT: Henshincon has a promo this week that will give you a discount if you purchase a ticket between now until March 17th. So, what are you waiting for? Hurry up and grab your tickets now! Go to http://www.henshincon.com for more info on the event and how to get your tickets. I hope to see you all at Henshincon!